I have been so excited to begin reading this book! The idea of using comprehension strategies applied to math is just exciting! Chapter 1 "Comprehension Strategies for Math", is a nice intro to the concept. I found lots of ideas that I agreed with, but really hadn't thought of through the lens of math. In reading, students use decoding skills then go beyond that, using strategies to construct meaning. In math, students should be able to use the same strategies to construct meaning. Thought processes, prior knowledge, and knowledge about context are used to construct meaning in reading. The same are used to construct meaning in math! Just like good readers create meaning for understanding, in math, we create meaning as we process mathematical concepts and solve problems. Seven comprehension strategies enhance the ability to construct meaning. 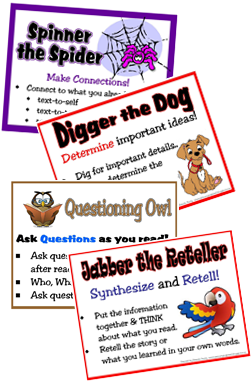 These strategies are effective in BOTH reading and math. I will admit that I have truly never thought of it before, but of course I use those strategies when working in math! The beauty is, that just as we have provided specific instruction in these strategies in our reading instruction, we can do the same in our math instruction to help our students be better, and more natural, mathematicians! Explain WHAT the strategy is. Explain WHY the strategy is important. MODEL HOW to use the strategy in the actual context. GUIDE STUDENTS as they practice the strategy. Students INDEPENDENTLY use the strategy. Along with the explicit instruction, we need to help our kiddos know WHEN to use specific strategies. Some are best used at the beginning of working with a problem, others during, and even after! I am so ready to dive into the rest of the book! I already have plans formulating in my brain! What were your thoughts? We'd love to hear them! Make sure to link up! And please grab the button above for your post! ALSO-- in celebration of the book study launch....I'd love to giveaway TWO sets of my Beanie Baby Comprehension Poster Packs!! I'll choose winners on Tuesday! Which of the strategies do YOU use when working on math problems? 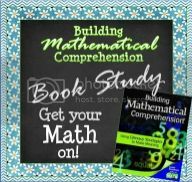 How can the use of comprehension strategies help your kiddos develop a conceptual understanding of math? I use making a connection and building background. In kindergarten some of my students have no prior experiences or background in math. They can count routly but don't understand the concept of one to one correspondence. To help them make connections I use a variety of manipulatives. I model, question, and watch them use and explain it to their peers. All of the stratedgies will come into play to build understanding, but, without making a connection with the student comprehension maynot occur. I use making connections, inferencing, and determining importance the most when problem solving. Even though I taught 4th grade math this year,I had a wide variety of levels because I had about an even split of students who came from public school, homeschool, and private school backgrounds. We had to go back and build a lot of schema and make connections to try to help bridge the gap in their prior knowledge of mathematical concepts. I taught kindergarten for 7 years before and was use to a wide variety of knowledge levels, but this year was definitely the most diverse. At my school all grades except kindergarten are departmentalized, but we have discussed team teaching reading and math because our student's problem solving struggles are linked to comprehension. I was very excited to find this book and this blog study to discuss these ideas as I'm reading! Great post, Brenda! I really enjoyed reading what you had to say about the chapter and especially liked the chart with the comprehension strategies! P.S. Don't count me in for the giveaway! That should go to someone else! After reading Chapter 1 ..it makes sense as to why we now have to teach Literacy through the other subjects! Characteristics of Good Readers and Characteristics of Mathematicians also stood out in my mind. I also like the Math Huddle concept rather than just telling the class to "Pair Share" or get into small groups. I think this book is going to be very insightful for many of us. Thank you for spear heading this Book Club this summer. It's a great idea to use comprehension strategies in math too. It's especially great for ELL's too. It's important to think about them before, after and during math. Most often I use Making Connections and Visualizing! I LOVE to use Children's Literature in math class also. Students become so involved in the lesson when there is a good book attached to it! I can't wait to continue reading and improve my math lessons to help students dig deeper, build a better understanding, and express their understandings. I especially like the "math huddle" concept. Just got my copy of the book; will try to catch up with the reading this week and then participate.